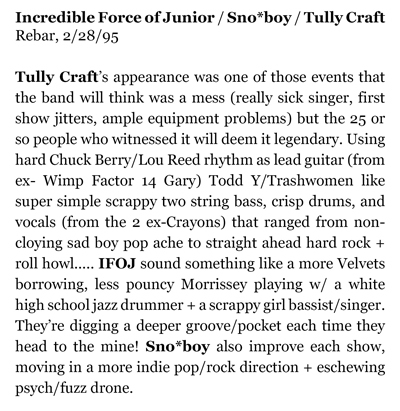 On February 28, 1995, Tullycraft played their very first show at a small club in Seattle called Re-Bar. It was a Tuesday and there weren’t many people in attendance that evening, but among them was Jeff Smith from the pre-Mudhoney band Mr. Epp & the Calculations. Jeff ended up writing a review of the show in a zine he published at the time called Feminist Baseball (see review below). Also on the bill that evening were the bands Incredible Force of Junior and Sno*Boy. 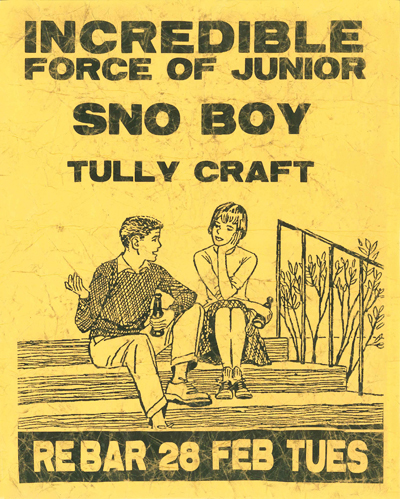 Ironically, Chris (from IFOJ) and Harold (from Sno*Boy) would both eventually join Tullycraft. Chris is still in the band today. Here is a live recording of the song “Mental Obsession” from that fateful night. Enjoy.